Later this year we’re going to get a star-studded, Disney-ized version of Stephen Sondheim and James Lapine’s Into the Woods, a 1986 musical mishmash of fairy tales, grim realities and realistic ever-afters. It will be fun seeing the likes of Meryl Streep and Johnny Depp singing Sondheim tunes and bringing these tales to life. But until then, we have real, live people doing this oft-produced show on stage at San Francisco Playhouse and making a strong case for the genius of Sondheim (especially, in this show, his lyrics). This is a big show in many ways: there’s a 15-member cast, which director Susi Damilano has augmented by one more in the form of a mostly wordless little boy to whom these fairy tales are being told and a panoply of characters, most of whom are efficiently introduced in the thrilling opening number. Some of this size and scope overwhelms this production (especially in some rather messy scene transitions), but comes through most potently are Sondheim’s wonderfully clever lyrics. There’s some unevenness in the cast, but when the performer clicks with the material, the humor and heart of the story comes shining through. Such is the case with Corinne Proctor as Little Red Ridinghood, as crystal clear an interpretation of the character – part little girl, part sexpot – as you could want. She bridges the worlds of childhood and adulthood effortlessly, and she really gets the jokes. Also keeping things grounded and fantastical simultaneously is Jeffrey Brian Adams as Cinderella’s Prince. He’s sincere and he’s hilarious and a little bit sad, which is just about perfect. His duet on “Agony” with Ryan McCrary as Rapunzel’s Prince is a show highlight. Tim Homsley as Jack (of “and the Beanstalk” fame) gets a nice moment to shine on “Giants in the Sky” and the ever-reliable Maureen McVerry is a hoot, especially in her noveau-riche incarnation once Jack starts bringing stolen loot down the beanstalk from the giants’ castle. Though a small part Cinderella’s evil stepmother is made memorable in a colorful turn from Bekka Fink, who also lends her lovely vocals to the ghost of Cinderella’s mother (who, in a nice turn, is actually the fairy godmother). Anchoring the show quite nicely are Keith Pinto as the Baker and El Beh as the Baker’s Wife. Their quest to end a curse and start a family is what ties all the familiar stories together, and the journey of the wife is quite potent. Beh does not come across as the typical fairy tale wife, and that’s fantastic. She seems like a real person with genuine conflicts who is capable of original thought – always a welcome trait in the world of musical theater. Her “Moments in the Woods” is an emotional high point of the darker Act 2, which delves into what happens after “happily ever after” (hint: it’s not happy). At nearly three hours, Into the Woods can be challenging, even with all its bright (and intriguingly dark) spots. Damilano’s production has its share of slow points, but musical director Dave Dobrusky keeps things rolling with his excellent seven-piece band (using the original orchestrations by Jonathan Tunick. And, happily, the rich sound of the orchestra never overwhelms the singers, so the lyrics are out there, front and center, right where they should be. 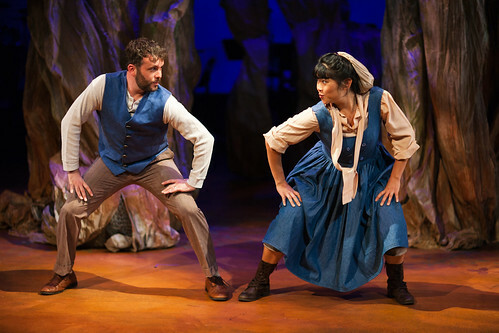 I talked to director Susi Damilano and actor El Beh about Into the Woods for a story in the San Francisco Chronicle. Read the story here. 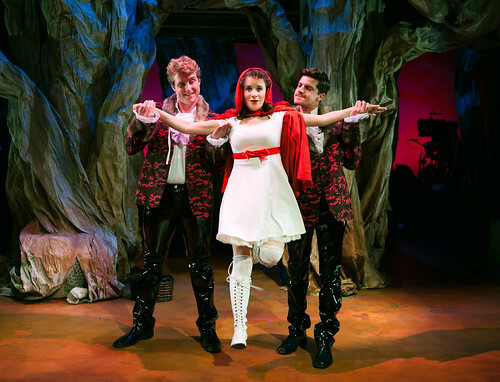 San Francisco Playhouse’s Into the Woods continues through Sept. 6 at 450 Post St., San Francisco. Tickets are $20-$120. Call 415-677-9596 or visit www.sfplayhouse.org.